PARIS, Oct 24, 2010 / — Louis XVI and Marie Antoinette are joining the 21st century! 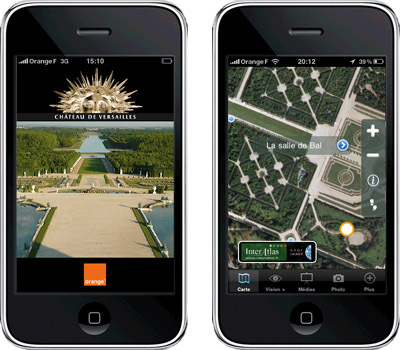 The Palace of Versailles and Orange launched the “Gardens of Versailles” iPhone App featuring their home. First developed for the iPhone, this English and French application is available for EUR1.59 and offers a variety of specific audio and video content relating to the gardens. The leading specialists on the Versailles estate (curators, architects, gardeners, water engineers) welcome visitors and introduce them to information of historical interest, details about the décor and some unknown features. This enhanced visit allows visitors to discover the gardens of Versailles either on-site or remotely. On-site, geopositioning (by Spot Image and InterAtlas) allows visitors to automatically receive information about the location where they are and to access audiovisual content. Enhanced reality allows visitors to open a virtual window onto the gardens, accessing information superimposed on the filmed image. Remotely, there is also a virtual visit for those wishing to prepare their visit in advance. This is a benefit for foreign visitors as all of the video content is downloaded in the application and can be consulted without an Internet connection. For the Palace of Versailles, this innovation is part of the Versailles Digital Project (Grand Versailles Numérique, GVN). Established in 2005, the aim of GVN is to design, test and deploy new digital tools used to enhance visits to the museum and to the Versailles estate. This innovative project benefits culture and visitors alike. As a partner of this initiative, Orange is illustrating its ability to use digital technology for the benefit of culture to as wide an audience as possible and to support institutions in their heritage promotion activities. Each year the Palace of Versailles welcomes over 10 million visitors to its estate. This center of world heritage serves simultaneously as a royal residence, a French history museum and a national palace where Parliament convenes. The estate has been under the guardianship of the Ministry of Culture since 1995 and has been awarded the status of public institution of administrative nature. It employs 1,000 people who work to share the unique heritage entrusted to them and to develop cultural activities worthy of this grand location.